Loomis Bread for sale. Buy online at Zingerman's Mail Order. Gourmet Gifts. Food Gifts. 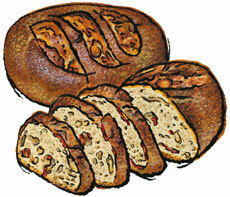 Zingerman's roasted red pepper and cheese bread. It took the coordinated efforts of three Zingerman's artisans to create this special loaf. The roasted red peppers come from Zingerman's Cornman Farms. The chunks of cheese are cut from wheels of Great Lakes Cheshire, made at Zingerman's Creamery. They're both mixed with tangy Farm Bread dough from Zingerman's Bakehouse and baked 'till they're nice and crusty. A spiritual cousin to our Chile Cheddar Bread, Loomis bread has been a huge hit with staff and locals alike, who wait months for this special bake. Quantities are limited.